This must be the first time “Monty Python’s Spamalot” has played an outdoor theatre AND had such a huge crowd watching because one of the creators, Monty Python’s Eric Idle made a surprise guest appearance after curtain call and led the crowd in a reprise of “Always Look On The Bright Side Of Life.” That was just one of the many magical moments for the opening of the 95th season of the Muny in Forest Park. With rain dampening the St. Louis area all day, the skies cleared just in time (with a short delay for a malfunctioning message board) for the most polished no-tech, no-dress rehearsal performance we’ve seen. Oh, there were a few glitches along the way, but the cast responded to opening night in spectacular fashion. John O’Hurley, has done the show many times before but the Muny stage is a whole other animal. He gives a dry, amazingly funny portrayal of King Arthur. In the spirit of the show itself, he sprinkles the performance with several ad libs along the way referring to St. Louis and particularly the nasty weather leading up to opening night. In fact, quite a few unexpected references to upcoming Muny shows and other highlights were featured in slight departures from the script. And what a script it is. It’s easy to forget how funny this show is and, anyone who’s a fan of the “Monty Python and The Holy Grail” film are especially pleased to visit the rude Frenchmen, Tim the killer rabbit and the other denizens of this nonsensical look at the Once and Future King legend. As his sidekick (who he mostly ignores- especially in song), Patsy, is played by David Hibbard with a flair for the comic dramatic. Chris Hoch displays panache as the suddenly “turned” Lancelot while Kevin Cahoon is his “outer,” Prince Herbert along with several other roles including the historian that weaves us through the unusual history of the Britons. Ben Davis is wonderful as the handsome “Dennis” Galahad and John Scherer makes a perfectly cowardly Sir Robin- who has had his lyrics to “You Won’t Succeed On Broadway” changed to a more “politically correct” interpretation. 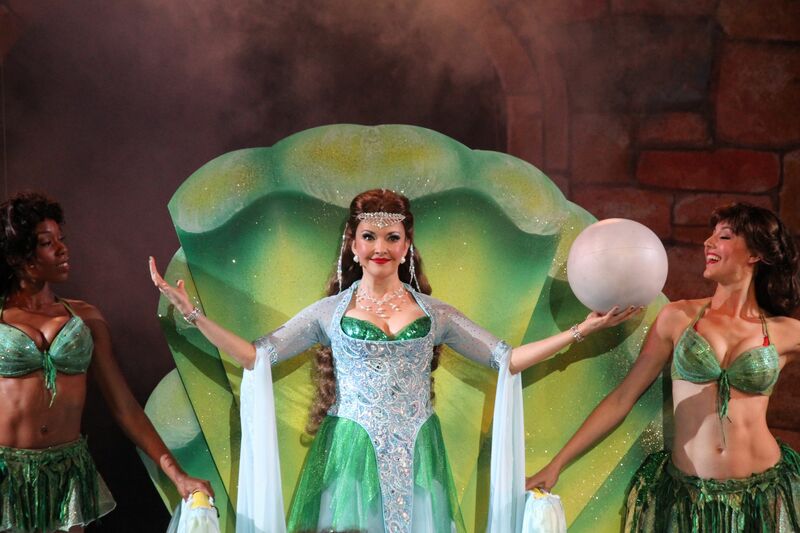 Michele Ragusa gives a splendid comic performance as the Lady of the Lake. Channeling Cher and other performers along the way, she delights with songs like “The Song That Goes Like This” and “The Diva’s Lament,” otherwise known as “Whatever Happened to My Part?” The entire ensemble shines throughout handling the silly story and songs with gusto and fortitude. 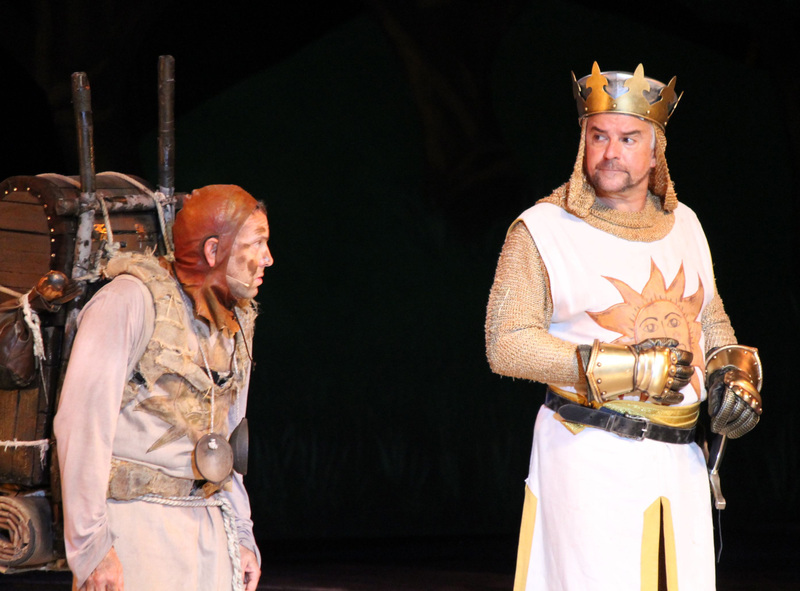 Thanks to Denis Jones’ lively direction and choreography and the musical direction of Ben Whiteley, “Spamalot” moves along at a great clip, not missing a sight gag or joke along the way. And then, to cap it off, onstage comes Eric Idle heaping more praise on the cast, the Muny and St. Louis in general, encouraging the crowd to photograph and video the sing along ending to send in to the Guiness Book Of World Records. A wacky finale to an explosively funny opening night. 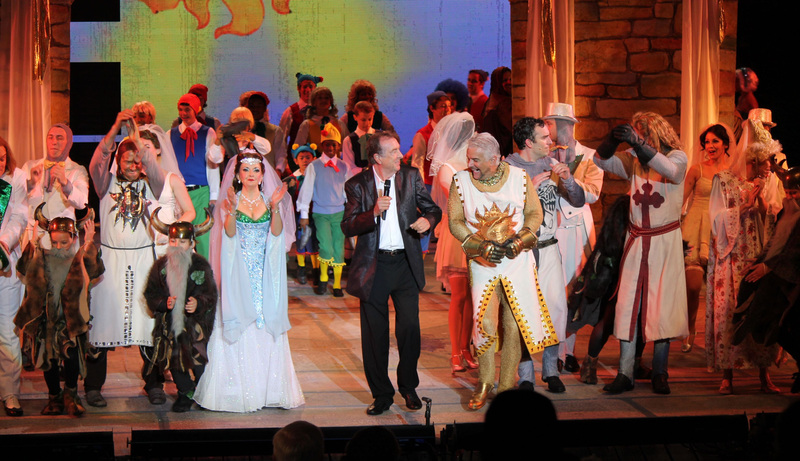 As we know, the Muny shows only hang around for a week- “Monty Python’s Spamalot” closes Sunday, June 23rd. So get your tickets now- you won’t want to miss the craziness of John O’Hurley and company in one of the funniest musicals ever written. This entry was posted on June 19, 2013 at 9:43 am06 and is filed under Uncategorized. You can follow any responses to this entry through the RSS 2.0 feed. You can leave a response, or trackback from your own site.